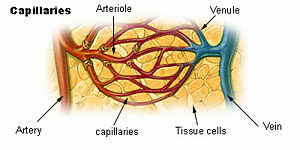 A blood vessel is any of the tubular channels that convey blood throughout the body, whether arteries (including threadlike arterioles) that convey blood away from the heart, veins (including threadlike venules) that convey blood toward the heart, or the tiny capillaries that connect arterioles and venules. Exchange of water, gases, and chemicals between the blood and the tissues occurs through the thin walls of the capillaries. Blood vessels in humans range in diameter from only eight μm (.008 mm) for the capillaries to 25,000 μm (25 millimeters, or one inch) for the aorta (Blakemore and Jennett 2001). In vertebrates, blood vessels are part of a complex circulatory system centered on the heart. The warm-blooded vertebrates (mammals and birds) have the most complex circulatory systems involving diverse vessel tissues and wall thicknesses, regulation of blood pressure, interactions with nerves and hormones, and so forth. The three principal categories of blood vessels are arteries, veins, and capillaries. Arteries are muscular blood vessels that carry blood away from the heart to the cells, tissues, and organs of the body. Veins carry blood toward the heart. They are are less muscular than arteries, and most of them have one-way valves that prevent backflow. The arteries subdivide into smaller arteries, which give rise to smaller, threadlike blood vessels called arterioles, which are the smallest of the true arteries. Likewise, venules are small, threadlike veins. Capillaries, the smallest of a body's blood vessels, connect arterioles and venules. The arteries are perceived as carrying oxygenated blood to the tissues, while veins carry deoxygenated blood back to the heart. This is true of most arteries and veins. However, the pulmonary arteries carry deoxygenated blood from the heart to the lungs and the umbilical artery carries deoxygenated blood from the fetus to the placenta through the umbilical cord. Likewise, the pulmonary veins carry oxygen-rich blood from the lungs to the left atrium of the heart, and the umbilical vein is present during fetal development and carries oxygenated blood from the placenta to the growing fetus. The difference between veins and arteries is their direction of flow (out of the heart by arteries, returning to the heart for veins), not their oxygen content. In addition, deoxygenated blood that is carried from the tissues back to the heart for reoxygenation in systemic circulation still carries some oxygen, though it is considerably less than that carried by the systemic arteries or pulmonary veins. The capillaries are where all of the important exchanges happen in the circulatory system, enabling the interchange of water, oxygen, carbon dioxide, and many other nutrient and waste chemical substances between blood and surrounding tissues. The size and thickness of the various blood vessels vary significantly. In humans, there is a 3000-fold range between the diameter of capillaries (eight μm) and the aorta (25 millimeters), with the aorta being the largest blood vessel in the human body (Blakemore and Jennett 2001). Likewise, the thickness of the walls of the various blood vessels various enormously, being thickest in the large arteries, less in veins of comparable diameter, and only a single cell thick in capillaries (Blackmore and Jennett 2001). Tunica media (the thickest layer): Circularly arranged elastic fiber, connective tissue, and polysaccharide substances. The tunica media may (especially in arteries) be rich in vascular smooth muscle, which controls the internal diameter of the vessel. The Tunica media and the third layer are separated by another thick elastic band called external elastic lamina. Tunica adventitia: Entirely made of connective tissue. It also contains nerves that supply the muscular layer, and, in the larger blood vessels, nutrient capillaries (vasa vasorum) as well. The walls of the aorta and its main branches are an intermingled fabric of fibrous collagen tissue, smooth muscle, and elastic fiber, the latter of which accounts for about half of the walls' mass(Blakemore and Jennett 2001). The elastic fibers are important in that they allow the vessels to maintain their integrity as they expand when blood is injected into them and then to constrict as blood flows from them to smaller arteries (Blakemore and Jennett 2001). Arterioles have a diameter of about 20 to 30 μm and relatively very thick walls, made up mainly of smooth muscle. The action of the smooth muscles in the arterioles determines the diameter of the vessels and the amount of blood flowing through them and accounts for the largest pressure drop throughout the entire circulatory system (Blakemore and Jennett 2001). Like the arteries, the veins are defined by their three-layer walls, but the vein walls are less muscular and thinner than the artery walls. The interiors of the larger veins are occupied by periodically occurring one-way flaps called venous valves, which prevent blood from flowing backward and from pooling in the lower extremities due to the effects of gravity. In humans, valves are absent in the smallest veins and most numerous in the extremities. At any one time, about 70 percent of the entire blood volume in a human is contained in the veins, which are very distensible, being able to accommodate large changes in their volume (Blakemore and Jennett 2001). Veins above the heart can collapse when empty, and the elastic tissue allows them to distend when filled, although expansion is limited by the indistensible fibrous tissue (Blakemore and Jennett 2001). When blood vessels connect to form a region of diffuse vascular supply it is called an anastomosis (pl. anastomoses). Anastomoses provide critical alternative routes for blood to flow in case of blockages and are prominent in the human body at several strategic locations, such as the knee and shoulder joints, and the scapula. Blood vessels do not actively engage in the transport of blood (they have no appreciable peristalsis), but arteries—and veins to a degree—can regulate their inner diameter by contraction of the muscular layer. This changes the blood flow to downstream organs, and is determined by the autonomic nervous system. Vasodilation and vasoconstriction are also used antagonistically as methods of thermoregulation. The blood pressure in blood vessels is traditionally expressed in millimeters of mercury (one mmHg = 133 Pascals). In the arterial system, this is usually around 120 mmHg systolic (high pressure wave due to contraction of the heart) and 80 mmHg diastolic (low pressure wave). Blood pressure falls to only about 30 mm Hg in capillaries (Blakemore and Jennett 2001). In contrast, pressures in the venous system are constant and rarely exceed ten mmHg. The pressures in the pulmonary artery is significantly lower than other arteries, being typically 25/12 mm Hg (systolic/diastolic) (Blakemore and Jennett 2001). Vasoconstriction is the constriction of blood vessels (narrowing, becoming smaller in cross-sectional area) by contracting the vascular smooth muscle in the vessel walls. It is regulated by vasoconstrictors (agents that cause vasoconstriction). These include paracrine factors (for example, prostaglandins), a number of hormones (for example, vasopressin and angiotensin) and neurotransmitters (for example, epinephrine) from the nervous system. Vasodilation, the dilation of blood vessels by relaxing the vascular smooth muscle, is mediated by agents achieving effects opposite to those of the vasoconstriction agents. The most prominent vasodilator is nitric oxide (termed endothelium-derived relaxing factor). Permeability of the endothelium is pivotal in the release of nutrients to the tissue. It is increased in inflammation in response to histamine, prostaglandins and interleukins, which leads to most of the symptoms of inflammation (swelling, redness, and warmth). The capillaries are exchange vessels, whose single layer of epithelial cells, with microscopic spaces between adjacent cells, allows the two-way passage of nutrient solutes passing into tissues and wastes produced by tissue metabolism passing into the blood (Blakemore and Jennett 2001). The number of capillaries is so vast that, despite their individual microscopic size, their composite flow capacities offer low resistance to blood flow, and their high density means a short distance for diffusion of nutrients and gases (Blakemore and Jennett 2001). Those capillaries nearer arteries have a higher pressure than those near veins (Blakemore and Jennett 2001). More active tissues tend to have a greater density of capillaries (Blakemore and Jennett 2001). Blood vessel permeability is increased in inflammation and blood vessels may hemorrhage either spontaneously or due to damage from trauma. In contrast, occlusion of the blood vessel (for example, by a ruptured atherosclerotic plaque, by an embolized blood clot, or a foreign body) leads to downstream ischemia (insufficient blood supply), and necrosis (tissue breakdown). Harper, D. 2001. Artery. In Online Etymology Dictionary. Retrieved May 3, 2008. Trupie, A. G. G. 2008. Veins: Introduction. Merck Manual. Retrieved May 3, 2008. This page was last modified on 25 August 2008, at 22:05.